Properties in Burkheim-Bischoffingen Station average 4.6 out of 5 stars. Modern holiday apartment, perfect for the city and enjoy nature! Property 46: Modern holiday apartment, perfect for the city and enjoy nature! Property 47: Family and active holidays, Europa Park Rust, canoeing, hiking ect. Not only is this apartment in a perfect location for exploring Colmar on foot, it has a special feeling that reflects the town's spirit and ambience. And what made our stay even nicer was the wonderful hospitality that the hosts, Brigitte and Christian, showed us--picking us up and dropping us off at the train station, leaving treats for us in the kitchen upon our arrival, making the booking process as smooth as possible, and answering our questions before and during our stay. 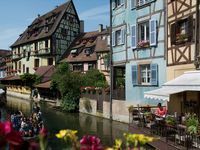 We thoroughly enjoyed our time in the apartment and on the patio, exploring and dining in Colmar, and sightseeing on our day trip along the Route des Vins, despite some cooler weather than we expected. All in all, our stay was everything we hoped it would be, and we thank Brigitte and Christian for helping to make our visit so wonderful. 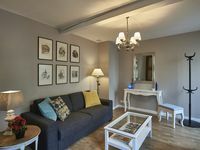 We highly recommend this apartment to any couple that plans to visit this enchanting town and area. Perfect place to be in Colmar! We stayed in this beautiful apartment in the center of town in Colmar. Bedrooms were large and shower bath facilities first class, Our hostess Charlotte was so kind , gave us great recommendations for restaurants, tours and had everything we needed for a perfect 3 days in Colmar. We had a wonderful trip and definitely recommend this apartment to anyone wanting a 5 star experience. We hope to return! Thank you so much Charlotte!